← AARON, SARAH AND C.B. The above photograph is one I took as a very young lad. Those of you that grew up in Arizona will recognize the performers as Wallace and Gerald of Wallace and Ladmo fame. 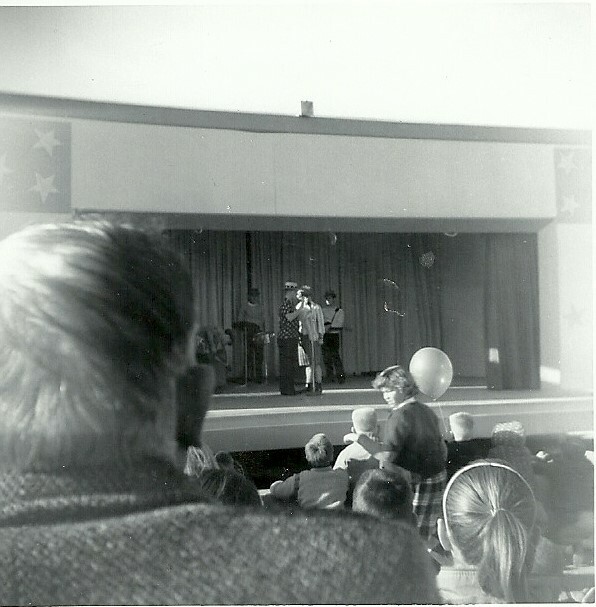 The photograph was taken at Legend City, an attempt in the early Sixties to re-create Disneyland in the desert. We decided to make the trip to Legend City the first year it was open in 1963. From Prescott it was a 100 mile trip to the fun park. I remember we left very early in the morning, so early that the sun was just rising when we got to Phoenix. I also remember getting my dad getting lost on the one way streets in downtown Phoenix. The other thing that stands out in my mind about that morning was the smell. To get to the park we had to pass the stockyards, Fortunately, the smell dissipated by the time one got to the park, except on the occasion of the wind blowing to the east, then one could catch a whiff of the yards over the smell of fried chicken at one of the parks food booths. Of course the day is a blur of fun and fast food and soda. The big highlight of the day was seeing Vonda Kay Van Dyke and her ventriloquist act at the the Golden Palace Saloon. For those who don’t know, Vonda Kay took that act and became Miss America in 1965. My second and last trip to Legend City was when I was in junior high and a mediocre drummer in the junior high band. We took a trip down to Legend City and marched down Main Street with other school bands. And on a school day, too. Legend City never became a success. I suspect a lot of it has to do with being located in a desert. Riding a roller coaster in 110 degree heat can’t be all that fun. It eventually closed for good in 1983. Salt River Project offices now sit where the City once stood. Legend City did have a 50th anniversary celebration in June of 2013. The Legend City website can be found here. Love seeing film photos – something so magical about them. Cool! That’s a pretty good shot 😉 I love seeing old photos. Thanks for sharing. Thank you. I am pretty sure I shot this with a little box point and shoot I had earned because I ordered enough books from a JR high book club.